Environmental studies professor Elliott Campbell made the cover of Earth and Space Science News with his assessment of a new way to estimate the impact of climate change. Associate Professor of Psychology Shelly Grabe edited a radical new book about how a psychological perspective can offer critical insights into understanding women’s rights and resistance. 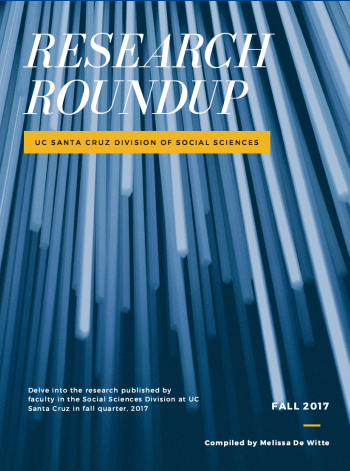 Climate change, feminism, stereotypes, political art, sanctuary spaces, human rights are just some of the many topics faculty in the social sciences published in fall quarter. Amanda Lashaw co-edited Cultures of Doing Good: Anthropologists and NGOs (University of Alabama Press, 2017), a volume that examines a growing subfield of social science inquiry: the anthropology of nongovernmental organizations (NGOs). The book serves as a foundational text for how anthropologists can study what NGOs do, as well as how to empirically engage with the actors that shape international development, reform, humanitarianism, and human rights work. The book includes essays by senior scholars on a wide range of regions and issues, including normative democratic civic engagement, elitism and professionalization, the governance of feminist advocacy, disciplining religion, the politics of philanthropic neutrality, NGO tourism and consumption, blurred boundaries between anthropologists as researchers and activists, and barriers to producing critical NGO ethnographies. Lashaw also co-authored the book’s conclusion where she explores both the complexities and possibilities of contemporary anthropological scholarship on NGOs. How can educators create space and break barriers for marginalized students? Judit Moschkovich explores this question in a book chapter that addresses challenges math teachers experience in the classroom. Research has found that marginalized students can be silent during class. But as Moschkovich shows, there are a range of opportunities to invite students who are quiet, including writing, reviewing, and revising drafts of mathematical arguments or solutions. “The time for action is now–but it starts with a consensus that innovation and inclusion, economic growth, and social justice need to go hand in hand,” writes Chris Benner and co-author Manuel Pastor, a UCSC alumnus and former UCSC professor now with the University of Southern California, in a new article in The National Civic Review. Benner and Pastor’s piece builds on their comprehensive research on economic growth in American cities. Their past two books have examined how a handful of regions across the US successfully created not just growth but “just growth”–economic development that links prosperity and inclusion. Now, Benner and Pastor articulate key lessons to emerge from their extensive research. Equity needs to be the cornerstone of any economic development effort, argue Benner and Pastor. Disparity is a threat to economic advancement: metropolitan fragmentation, high levels of income inequality, and racial segregation in housing can all derail employment growth. What encourages growth? A diverse and dynamic epistemic (knowledge) community, say the two researchers. For many communities, this can be achieved by coupling conversation with collaboration. Benner and Pastor stress that creating epistemic communities is not easy work. Civic leaders must not shy away from what can be difficult or uncomfortable discussions (particularly about race and why differences continue to persist over time). Conflict must come with a willingness to engage across the political and ideological spectrum with collaboration as the goal. Roots, relationships, and reason are three factors that can help leaders foster meaningful and proactive discussions in their community. Glaciers are rapidly losing mass, reports Jeffrey Bury and a team of researchers in a long term, transdisciplinary study on glacier melt in the Peruvian Andes. In the article, Bury and his collaborators share a framework to assess how glacier change will alter the lives of many Peruvians who depend on their environment for their livelihood. The researchers analysis connects the complex consequences resulting from glacial melt. At stake are water availability and quality, the landscape and ecosystem, and Peru’s entire market economy. In addition, there is a challenging governance process at play. But it might be a while before these devastating effects are felt, warns Bury and his coauthors.. Climate change modelling can be a challenge. For some it is a moving target, constantly disrupted by changing environmental conditions, new technologies, and scientific discoveries. For Campbell and his interdisciplinary team of earth science scholars, it’s also an Achilles heel. “We don’t know enough about feedbacks from the terrestrial biosphere,” reports Campbell and his coauthors. “Models of the global climate system differ greatly in their estimate of carbon uptake, leading to critical uncertainties in global climate projections,” he goes on to argue about the disparities in projections. 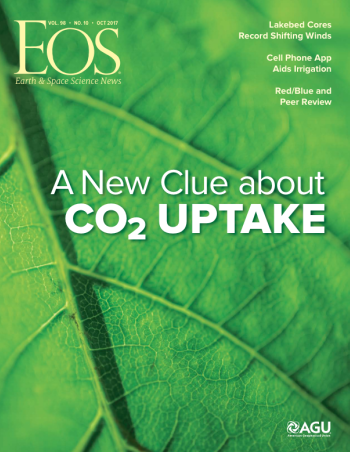 Campbell offers a new way to study climate change: measure a gas called carbonyl sulfide (COS). Because COS is more persistent and pervasive across continental regions (including terrestrial and atmospheric areas), it makes satellite and atmospheric surveys more able to detect variations. While there are a few complications and limitations that Campbell outlines (including more experiments needed), COS has the potential to be a more accurate way to understand a changing environment. Deborah Letourneau and co-authors Margaret Fitzsimmons and Diego Nieto set the stage for the interdisciplinary book Environmental Pest Management with a chapter on how pest management in agriculture is driven as much by political developments as by scientific discovery, using Central Coast strawberry production over the last century as a case study. There are many ways to protect plants from pests as Letourneau and her coauthors demonstrate in the chapter. While growers have often turned to pesticides, the public demand for pesticide-free produce has paved the way for ecologically friendlier strategies. In the chapter, Letourneau examines the research and policy needed to expand Integrated Pest Management (IPM), an approach that harnesses a wide variety of techniques–including cultural, biological, and structural designs–to control pest problems in agricultural systems. Tactics must be compatible and ecologically sound, urges Letourneau. Want to go green? Try pink instead! A new study by Environmental Studies Professor Michael Loik tested electricity-generating "smart" greenhouses that are outfitted with a magenta luminescent dye that absorbs light and transfers energy to photovoltaic strips. The study was also featured in the campus-wide newscenter and prominent media outlets including Newsweek. Strawberries are one of the most critical crops to Central Coast growers in California. For decades, strawberry farmers relied on the powerful but environmentally hazardous soil fumigant, methyl bromide to control disease and pathogens. In 2016, it was finally phased out in California. While there are other soil fumigants on the market, they still pose health and environmental risks. Farmers are seeking alternatives to soil fumigation and Carol Shennan and Joji Muramoto are helping them find solutions. Shennan and Muramoto are testing a new, innovative technique called anaerobic soil disinfestation (ASD). ASD temporarily makes soil anaerobic (free of oxygen) by integrating a carbon source such as rice bran or molasses into the topsoil, covering the soil with plastic film to prevent any resupply of oxygen, and soaking the soil with water. The soil is then left for several weeks to ferment. Unlike fumigation, ASD is a biological process that requires the right conditions to control disease. Shennan and Muramoto’s latest study published in Plant Pathology reveals positive findings from their field trials in Castroville, Watsonville, and Santa Maria. They report that ASD with rice bran as a carbon source controlled a number of important soilborne pathogens and induced changes in the soil microbiome throughout the growing season. In addition, three of four trials produced marketable fruit yields equivalent to fumigation. Shennan also published a review paper with graduate students Graeme Joel Baird, Hamutahl Cohen, Kelsey Forbush, and Robin Lovell that explored the debate surrounding the role of agriculture in food production systems. Specifically, they examined how both the wider public and research community continually and problematically make organic versus conventional comparisons. Instead, the authors claim that differences across the two systems depend more on factors such as crop rotation structure, landscape heterogeneity, farmer knowledge and investment capability, and while evidence suggests somewhat lower crop yields in current organic systems they find considerable evidence for greater environmental and social benefits. Given these advantages they call for increased investment in research on organic and ecologically based farming systems. In a new paper for Economic Inquiry, Daniel Friedman explores the Monty Hall problem, a classic thought experiment in probability. The problem is named after the host of Let's Make a Deal, a popular game show where contestants were presented with three curtains each hiding secret prizes. Behind one of the curtains was a dream prize–a car, vacation, cash. Behind the other two curtains would be less desirable items–a fridge full of cottage cheese, a pet goat, or a clunker. Contestants would make a guess, hoping they guessed the big prize. But before the grand reveal, Monty Hall bartered with contestants. They could stick with their original guess and take an all-or-nothing risk or opt for safer options. In economics, the Monty Hall problem is a variation on the situations presented in the show. The brain teaser goes something like this: after you make your selection, Monty Hall reveals a dud prize behind one of the remaining curtains. He then offers you the option to stay with your first guess or switch to the other unknown option. You don't know if you guessed correctly and you don't know if behind the other curtain is the big prize. Are you better off sticking with your first guess or switching to whatever door is left? Or does it not matter? It's a dilemma that continues to attract interest because most empirical tests have shown that a majority of people do not switch but stick with their original option. There are a variety of reasons that behavioral economists have used to explain this irrational behavior: illusion of control, escalation of commitment, confirmation bias, or as Friedman finds–improper Bayesian logic. Bayes logic is the interpretation of probability that uses knowledge of prior events to predict future outcomes. Many people mistakenly assume that after Monty reveals one of the three curtains, their chances of being correct the first time jump from one third to a 50%. However, the probability is still ⅓. Switching increases probability of winning the prize to ⅔.
Friedman conducted a series of experiments that replicated both the Monty Hall problem and the various explanations about people's irrational choice. He found that the root problem is a failure in Bayesian updating, specifically the failure to correctly understand probability outcomes. Failure to correctly understanding Bayesian logic can have real world implications especially in things such as medical diagnosis, startup investing, and warfare says Friedman. One of the revelations to come out of the 2008 financial crisis was the flawed process of how credit rating agencies determine risk. As markets rebound, what influence do credit ratings agencies (CRAs) play in markets today? In the latest working paper published by the UC Santa Cruz’s Center for Analytical Finance, Michael Hutchison and his co-authors examine whether announcements on credit worthiness from credit rating agencies affect market prices of sovereign bonds. CRAs have fallen into disrepute since their massive failure to accurately judge the riskiness of debt prior to the Global Financial Crisis. Hutchison questions whether market participants continue to take CRA ratings (risk assessments) of bonds seriously. The results of the statistical analysis are surprising, and indicate an even larger effect of credit rating agency announcements post-crisis. “We find that negative announcements, and credit rating downgrades in particular, have a larger impact on market risk-pricing following the financial crisis,” writes the distinguished economist. “However, accurate measurement of these effects depends importantly on conditioning the prior-state of the sovereign bond prior to the credit rating announcement.” That is, disentangling the information value of a CRA announcement depends critically on the bond’s past credit history, for example whether it was already on a “watch” status, the bond credit rating at the time of announcement. What can light emissions tell you about economic development? Quite a bit, according to a new study by Ajay Shenoy. Shenoy looked at changes in nighttime light emissions in the Indian state of Uttarakhand to study whether a place-based policy aimed at compensating for Uttarakhand’s remote location in the Himalayas actually created the intended outcome of regional growth. Uttarakhand is a newly formed state with a small population spread across rugged mountains. To attract business to the state, the central government channeled federal funds towards building local infrastructure and granting state-specific tax benefits. Shenoy found light emissions rose sharply after this policy was introduced. Since light emissions are a common proxy for economic development, the increase in light emissions indicates that state GDP increased, and that new infrastructure was built: electricity and other basic public goods and amenities (such as latrines and solid roofs) that are essential to development and poverty alleviation. Sylvanna Falcon authored a journal article on public art and memory making in Peru following the conflict the country experienced in recent history. One of the outcomes of the transnational justice period was producing and documenting memories through art. “In the post conflict context of Peru, art depicting some aspect of the internal conflict is meant to offer a critique or layered commentary on what happened, as well as provide a moment of pause about the breadth, depth, and extent of the violence,” Falcon writes. Falcon examines three public art projects–all counterpublic representations–to understand alternative ways the country recognized and reconciled memories of its violent past. The pieces include a mural outside the Association for Human Rights that depicts past and future Peru; a memorial that represents lives lost during the internal conflict; and a traveling art museum. Falcon chose these projects because of the contributions the counterpublic made in their creation and also that they are situated in publicly accessible spaces. “These dissident artistic engagements occur within a context in which powerful and elite forces from the dominant public converge to stymie holistic transitional justice representations by the counterpublic,” writes Falcon. Falcon draws on intersectionality–a way of thinking that explores how forms of discrimination combine, overlap, or interact–to examine the artworks. Through a lens of intersectionality, she was able to reveal how power can manifest in memory-making processes. “These art projects, and ones that still have to be envisioned, could become part of a democratic project of inclusivity in which intersectionality is used as a core lens through which to continue producing and analyzing wide-ranging representations of the internal conflict that aim for increased visibility and accountability,” she argues. Falcon also authored a chapter about feminist solidarity and the limits of human rights awards, arguing that they recognize individual achievement at the expense of community/collective activism. Falcon suggests that awards must be understood against a larger context of neoliberalism and transnational corporate interests. Sylvanna Falcon and Pascha Bueno-Hansen, “Indigenous/Campesina Activist Awards: Deriving Lessons for Transnational Feminist Solidarity,” in Decolonizing Feminism: Transnational Feminism and Globalization, ed. Margaret McLaren (London: Rowman and Littlefield), 57. Politics professor and Andrew Carnegie Fellow Sikina Jinnah writes about the politics surrounding climate engineering, a controversial group of emerging technologies that aim to moderate global temperatures by either reflecting solar radiation or capturing and sequestering carbon dioxide. In the first of two pieces on the subject, Jinnah proposes an international governance framework for solar radiation management (SRM), a group of technologies that could possibly create a cooling effect by reflecting sunlight back into space. The article is part of a special issue of the journal Climate Policy, which explores pathways towards meeting the 1.5℃ target set in the Paris Agreement on climate change. Jinnah proposes a set of policy interventions that ensure climate engineering research is transparent, and allows for public participation through, for example a newly established public forum. Sara Niedzwiecki delves into how scholars research welfare states, an area of scholarship that cuts across many subfields and disciplines including political economy, comparative politics, international relations, and American politics. Because of its interdisciplinarity, Niedzwiecki advances ways scholars can draw multiple methodologies into their research. The proportion of studies of welfare states that harness mixed methodology is incredibly small. Of all published works between the 1990s and 2016, less than 1% combined different types of analysis, finds Niedzwiecki. Nick Davidenko and graduate student Jennifer Day have a new paper in Visual Cognition about how people draw upright and inverted faces. Art teachers often instruct novice students to practice drawing inverted faces, in order to avoid perceptual biases that arise from our high-level knowledge and assumptions about how faces look. Davidenko and Day’s research challenges this notion and shows that in fact upright faces are drawn more accurately by novice (non-artist) students. Davidenko and Day uses a set of measures to see how upright face drawings came out as more accurate representations of the target faces. Despite well-intentioned efforts from the human rights community, grassroots organizations, solidarity groups, scholars, and the United Nations, women’s equality has yet to be realized. Addressing this serious issue is Shelly Grabe in a radical new book she edited about how a psychological perspective can offer critical insights into understanding women’s rights and resistance. 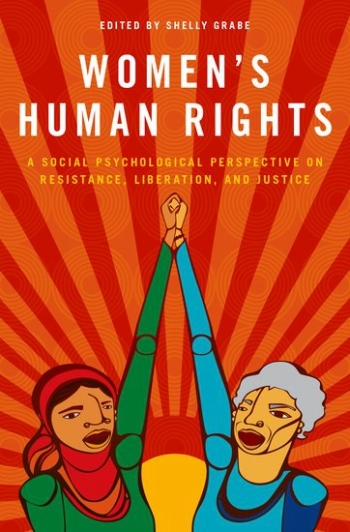 “Psychology can shed light on the diverse experiences of women resisting human rights violations and suggest means by which psychological processes can effectively challenge the broader structures of power that exacerbate the violation of women’s rights,” writes Grabe in the book’s introduction. Campbell Leaper published a book chapter on "Growing up gendered: Feminist perspectives on development" in the American Psychological Association's Handbook of the Psychology of Women. Leaper wrote the chapter with two of his former graduate students, Rachael Robnett and Elizabeth Daniels, who are now professors at the University of Nevada and the University of Colorado, respectively. The chapter reviews multiple ways that gender inequalities are created, maintained, or overcome in childhood and adolescence. The topics include gender identity and expression, childhood play, gender biases in academic and athletic achievement, sexualization and body image, traditional dating scripts, sexual harassment and heterosexism, and traditional masculinity ideology. Leaper and his co-authors also examine how feminist identity can help to empower girls and young women. “People in different communities can learn from each other’s strengths to expand their own ways of doing things as well as to better serve the learning and development of people from cultural backgrounds different than their own,” writes Barbara Rogoff and her colleagues in an article that examines differences in child development practices. Rogoff argues that researchers should document the strengths of children from non dominant backgrounds as this will aid educators to focus on children’s strengths, ultimately helping children from all backgrounds learn to do things more than one way. Now in its seventh edition, Who Rules America? by William Domhoff has never been out of print. In recognition of the 50th anniversary, Domhoff and eleven coauthors have published a new volume, Studying the Power Elite: Fifty Years of Who Rules America. Twelve sociologists and political scientists offer new insights and findings on many contemporary issues, including the privatization of the public schools system; foreign policy and the role of the military-industrial complex; the successes and failures of the labor rights movement; the global expansion of agribusiness; and banking reform in the aftermath of the recession. Domhoff presents a new neurocognitive theory of dreams in his book, The Emergence of Dreaming (Oxford University Press, 2017). He emphasizes a theory that dreaming and drifting waking thought are similar. The book is based on laboratory and non-laboratory studies that found as many as 70 to 80 percent of dreams are dramatized enactments of significant waking personal concerns about the past, present, and future. “The findings on the rich and varied nature of dream content provide the starting point for sorting through the many neurophysiological and neurocognitive discoveries that could lead to the neural network that enables dreaming,” writes Domhoff. For the past two years, Miriam Greenberg, Steve McKay and a team of 200 undergraduate students gathered data about what living in Santa Cruz is really like. The result of their extensive study is No Place Like Home, an interactive website that culminates Greenberg and McKay’s research. Greenberg and McKay collaborated with organizations that serve a diverse range of county residents, particularly some of the most vulnerable populations, including the Community Action Board of Santa Cruz County, Community Bridges, and California Rural Legal Assistance to explore the many dimensions of life as a renter during a housing crisis. The project included a comprehensive renter survey, interviews, historical and policy analysis, creative non-fiction, audio documentaries, photography, infographics, and mapping. Katharyne Mitchell examines how faith-based organizations in Europe are responding to the flow of forced migrants. Mitchell met with over 50 pastors, priests, church administrators, activists, and politicians in Geneva, Vienna, Berlin, Brussels, Athens, and Mytilene to better understand how their humanitarian efforts and religion connects to issues of politics, governance, resistance, and justice. Mitchell found that church organizations are influenced by their faith to help others. Some groups are protecting migrants at risk of deportation by offering sanctuary spaces and asylum–even if the act goes against the law. Mitchell examines themes of rationality, neoliberalism, and “the messiness of human values” to better understand activism, migration relief work, and humanitarian governance. Mitchell’s study was also featured on the campus-wide news center. The Postgenomic Condition: Ethics, Justice, and Knowledge after the Genome (University of Chicago Press, 2017) by Jenny Reardon explores the many dilemmas facing society and the healthcare industry since the sequence of the human genome. DNA sequencing has enabled a new collective understanding of the human body and as Reardon illustrates, the political body as well. “The question of the meaning and value of the human genome is but one instantiation of this broader questioning of the capacities of dominant liberal modes of knowing and governing,” writes Reardon. Reardon reflects on big issues including how to make meaning from data being gathered as a result of the human genome project. She raises critical concerns about how to create meaningful life in the midst of depleting natural resources, growing inequalities and deluging data–both in the sciences and broader societies. What is the meaning of all this data that is collected on our behalf? Is it valuable for understanding life and living in democratic societies? Addressing the deluge of data and eroding trust in dominant institutions are at the heart of what Reardon labels the postgenomic condition. Anthropologist Lars Fehren-Schmitz received significant media coverage for his paleogenomic analysis of the remains of early inhabitants of Easter Island, including this write-up in Science magazine. Economist Rob Fairlie was featured in an Inc. magazine story about the hiring practices of startups. Environmental Studies Professor Jeff Bury was quoted prominently in a New York Times story about the impacts of climate change on farming in Peru, where warming temperatures are melting glacial ice, providing a new–but finite–source of water. Newsweek covered new research by Michael Loik of environmental studies about the electricity-generating power of solar greenhouses, which appear to have no negative impacts on the plants grown inside them; the greenhouses use technology developed by Physics Department faculty members Sue Carter and Glenn Alers. The Santa Cruz Sentinel reported on a $2.5 million USDA grant that will extend the reach of new strategies being developed by Environmental Studies Professor Carol Shennan to fight soil diseases in commercial strawberry production. Puma expert Chris Wilmers of Environmental Studies was quoted in two San Francisco Chronicle articles about a mountain lion that was spotted in the city–and subsequently turned over to Wilmers for relocation. He was also featured in a podcast produced by BeProvided Conservation Radio. A talk about the art of politics and meditation by Dean Mathiowetz of politics was covered by Mustang News in San Luis Obispo. Craig Haney was featured in a 60 Minutes report on California's Pelican Bay Prison. Psychology Professor Cam Leaper shared his expertise on gender and child development with Slate as part of an article that included tips for parents who want to instill more egalitarian gender beliefs in their children. Lindsey Dillon was quoted in a Salon article about how the Trump administration is systematically rolling back environmental protections and dismantling the achievements of the environmental justice movement. William Domhoff's new book, Studying the Power Elite, was reviewed by the Financial Times. Also, in an article about the paucity of black CEOs, The Atlantic cited Bill Domhoff's book, The New CEOs: Women, African American, Latino, and Asian American Leaders of Fortune 500 Companies. The Santa Cruz Sentinel is among the news outlets covering the "No Place Like Home" project led by Sociology faculty members Steve McKay and Miriam Greenberg; student researchers surveyed more than 1,700 renters in Santa Cruz County. The Santa Cruz Sentinel announced that Steve McKay, associate professor of sociology, is being honored as a "community hero" by the Community Assessment Project; CAP recognized his work on the local housing crisis and a major survey that captured the experiences of renters. Jenny Reardon’s new book, The Postgenomic Condition: Ethics, Justice, and Knowledge After the Genome, was reviewed by Nature.